Everybody is always looking to be ahead of "the next big thing." We've all been amazed at some new hot-selling product and said, "Why didn't I think of that?" 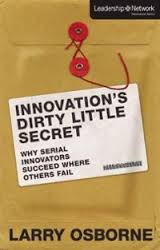 In the book Innovation's Dirty Little Secret, author Larry Osborne takes a look at how some innovators are able to successfully come up with new ideas time and time again while others fail to make a mark. So just what is innovation's dirty little secret? Well, it's not a spoiler to say that it's this: that most innovations fail. There are a number of reasons why most people don't know this, from failure not being newsworthy (unless it's on a spectacular scale) to the general optimism of human nature. The author uses personal examples gained in his experience as a pastor to show how to anticipate risks as changes are implemented. His principles are applicable in many different situations. Many organizations are steeped in protecting their current day-to-day operations rather than attempting to plan or prepare for the future. In order not to miss any important opportunities, it's vital that the organization identify those people within it who are insightful, courageous and flexible. These are traits that are natural to the innovator. The author also suggests that the best way to implement innovations without risking too much is to have an exit strategy in place before beginning. This will allow the organization to plan for what to do if the change turns out not to be beneficial. The major way to ignite innovation is by making sure your organization has a clearly written mission statement (which differs from the overall vision of the group). The section on how to Sabotage Innovation contains many useful examples of how the best ideas can quickly go wrong. The book sums up with how to leave your own legacy of innovation with your group. Some chapters have questions at the end to help reinforce the main points covered. Overall, I found the book to have good ideas, but the main idea of the book, that innovators are born and it's the organizational leader's job to find that person, to be a bit odd. He also talks about how "Mark Zuckerman" wouldn't be able to get a job at many companies that hire based on minimum qualifications. I think he must mean Mark Zuckerberg? Still, for leaders of large groups there are some sound ideas about how to plan for change and how to prepare for failure.